Having a barista or cook away from the POS ordering station can be hard. If the sandwich or espresso line is close to the register, you can still have problems tracking multiple orders. The traditional way of solving this? Yelling the order out. It’s chaotic and causes a lot of mistakes. Handwriting orders. Employees can’t read what was written in a rush. Having a barista or kitchen receipt is a far better way to do this! The order prints right where the barista or cook is and allows them to see exactly what they need to make. In the example below, this shows the items, recipes, weights for portions and more. An example of the make ticket a barista or cook would see. 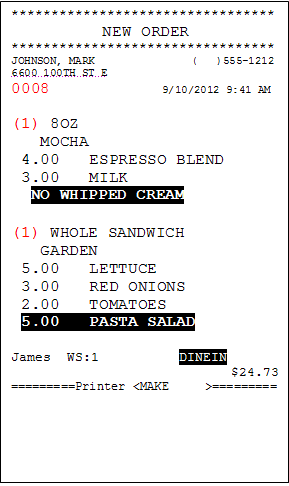 If your barista or cook is right next to the POS, you can still take advantage of this by printing out the make receipt out of the receipt printer you already have. A couple of optional features can enhance this as well. Add a buzzer to the printer and make sure your kitchen staff can hear when an order prints. Add a sticky option for paper and have make tickets that double as customer receipts by sticking right to the cup or bag! Want more information? As always, give us a call and we can help make you more efficient! I know that networking is not foremost on most restaurant owners minds but it is an important topic. What we mean by segmenting your POS is that you should keep it separate from other, non-critical, computers on the network. Segmenting the network can involve putting the point of sale on a router that is has nothing else on it. A typical configuration will see the POS on one router and other store computers or wireless on a second router. The important thing is too keep all of your POS networking on one router so that there is no cross communication between computers and other devices in your store. Time to review your SelbySoft security! In case I haven’t said it already – Happy New Year! With the new year comes a time for reflection on the past year as well as an eagerness to improve in the next one. I was talking to Eric (our Customer Service Manager) the other day and asked him what he thought our customers should review from the previous year. His response? Security. Our customers often setup their security levels when they first setup SP-1. For some of our customers, that is also the same time they are opening their brand new business. It is always a good idea to go through the security settings and audits so our customers can see if they need any modifications. Security levels: Who has access to what features? Does your employee need access to past days reporting or is today good enough? What about voiding tickets, deleting items or changing deliveries? Let us go through these settings with you and recap what is important. Employee Access: Are each of your employees using their own code or card to access the system? If not, maybe consider moving to that. Cash Accountability: Could you use a second cash drawer so you can separate out which employee did what? What about a second or third insert for shift changes? I hope that some of this makes you think about how SP-1 by SelbySoft can help assist your growth in 2014! Occasionally things break. Usually it is a small frustration but every once in a while it is a much larger problem. In those cases it is great to have a plan. Hopefully your plan is not to lock the doors and scream in panic! At SelbySoft, we plan on having spare equipment for mission critical components. We recommend that our customers think about the same thing. I’m talking about those of you with equipment that is 3 to 8 years old (or older!). In that case, it makes sense to either have a spare computer you have purchased from us or even a laptop of some sort that can be pre-configured in case of an emergency. If you haven’t thought about this before, give us a call and start a conversation about this. Let SelbySoft BACK YOU UP! Hopefully, you didn’t just picture the guys from Saturday Night Live with a couple of old school tape backups in their hands. We all know that catastrophe strikes when we least expect it. Unfortunately, in some cases, we start thinking about checking for backups after the catastrophe happens. You may be aware that part of our SP-1 by SelbySoft solution is a daily cloud based backup. We consider that step 1 of your backup solution. Step 2 is the store level backup. Why store level? Because it is possible for any cloud based backup to fail. What if your Internet provider goes down? Even something as simple as a cable coming loose or an employee accidentally stopping the service that does the backup can mean your backup is not happening. In order to be completely protected, you should be performing a local backup to a CD, DVD or USB drive daily. Further, make sure you take that backup offsite occasionally. Backups don’t do any good if they are in the store when that catastrophe happens. Need help setting up a local backup? Let us know and we can help you get it going. Single Station with one printer: You can print a receipt, barista ticket and kitchen ticket from the same printer. Single Station with three printers: You can print a receipt at the counter, barista ticket at the espresso machine and sandwich receipt in the kitchen. Printers with red/black ink for highlighting (useful for kitchens). Thermal Printers with logo printing and coupon printing directly on the receipt. Sticky thermal paper that will stick right to a cup. Boxlabel printers for sandwich bags. Finally, the option of forgoing a printer for the kitchen or barista and use a monitor with a bump bar instead. This system will allow you to see up to ten orders on the screen at a time! This screen can also be setup to only show certain menu items just like the printers. These are a great tool in high volume locations. Let’s face it. . . There is a good chance that you don’t take proper care of the equipment you are using for your POS. Follow some of the tips below to help make your equipment last! Backups: If you have not asked already, call us and see if you are on our FREE backup system. This is a cloud based backup that will backup all your data etc. Computers: They need to be cleaned once in a while. Make sure the machine is off and then remove the top of the case. Usually that is held on with thumb screws or regular screws. 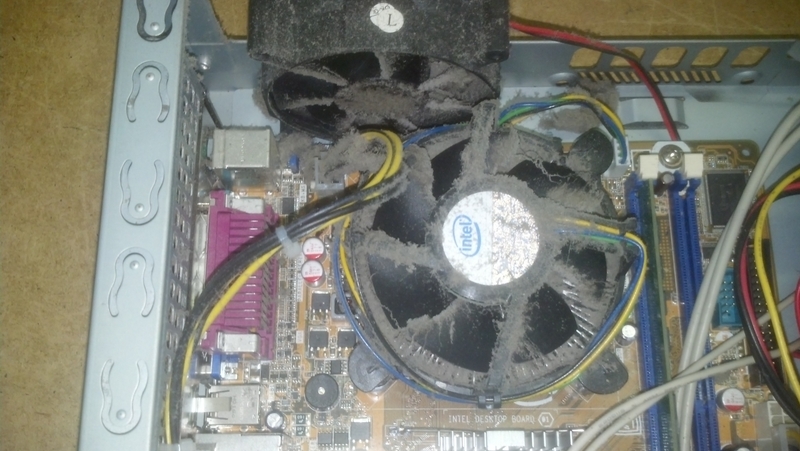 Once inside the case, use a can of compressed air to blow out the fans (be careful to not spin the fans so much that they whine). These fans help control the heat in the system and are responsible for a number of common computer problems. Printers: Your printers are incredibly important. They are also very easy to clean. Unplug the printer, pull the paper out and leave the lid open. Gently shake it while upside down. Then blow any paper out that you can . Check for bits of paper stuck under the cutter or around any of the gears. If you have a printer that uses a ribbon, make sure you use authorized manufacture ribbons. They will make a difference and the generic ribbons can cause damage to a printer. Monitors – Touch screens are pretty simple. The biggest thing is to check the cables periodically and make sure the cables are tight. Clean the screen by spraying non-abrasive cleaner (Windex or something similar) on a towel and wipe them. Make sure that employees are not using pens or anything pointy to ring up orders. Why Open WiFi Is A Bad Idea! Here is a real life reason why having an open WiFi connection can be a bad idea. Recently a customer called in and explained that their credit card system was down. That’s pretty serious and we wanted to make sure we get them up and running as soon as possible. Our support guys started checking the usual suspects and discovered that the store could load a web page and could even log our technician in over the internet. We checked our credit card settings and the services that are running there and everything looked great. They then decided to troubleshoot by bypassing SP-1 and running the card directly in the processors software. The card still did not go through. The next step was contacting the merchant services company that they use. It turns out that they are one of our preferred providers so we had an easy time of eliminating that as an trouble spot. That usually leaves an internet connection as a problem but we already confirmed that the computer was connected (heck, we were logged in remotely!). Finally after running some more tests, we discovered that this had nothing to do with the computers, our software or the merchant services at all. It was the ISP (internet service provider) that deliberately blocked this type of internet traffic! You see, at the store, there was an open WiFi connection for customers. This was simply enabled by turning on WiFi on the router. There was virtually no security activated at the router side. Because of this, someone using that connection was downloading things that the ISP flagged. The ISP started turning off activity from certain ports. That stopped the activity from the downloads but also from the credit card interface. If you use WiFi, have a company like www.webbeams.com set it up for you so it can be secure! PCI DSS is confusing stuff. The fact is that as a business that processes, stores or transmits credit card data, you are required to validate your compliance with the PCI-DSS standards. Note that I said you have to validate. That does not mean that your data is safe! Most stores are responsible for completing an annual Self Assessment Questionnaire (SAQ) and a quarterly report from an Authorized Security Vendor (ASV) that you have passed a network scan. Note that the PCI SAQ C-2 is the document that most of our customers are required to fill out. It’s 26 pages long and considered the “shortened version”. So, what does it say? In short, use common sense. There are 11 sections to the document and each has its own particular bit of verification. NOTE, don’t take any of the following as legal advice or as the final word on how to fill out your PCI documents! 1) Installed a firewall and have it configured properly. Hopefully you have secured your WiFi and separated it from your POS system. 2) Don’t use default passwords . We won’t let you do this in version 7.60 and above but you still need to do it with your other passwords in Windows, your router etc. 3) Protect cardholder data. Make sure that your POS does not store data and insure that the credit card numbers are masked etc. Don’t write credit card numbers down and use an integrated solution. 4) Encrypt transmission of the card data on networks. We encrypt the data per standards between the local nodes on the network. 5) Use an anti-virus. We like Microsoft Security Essentials. 6) Develop & maintain secure systems. Make sure you maintain your POS with the most updated version . Also your Windows critical updates need to be kept up to date. 7) Restrict access to cardholder data to people that need it. Since the cards are not stored in SP-1, this is handled. If you write numbers down and save them, then you are opening a whole other can of worms. 8) Assign unique ID’s to each person with POS access. You do have unique employee ID’s right? 9) Restrict physical access to cardholder data. Since we don’t store cardholder data this should be a no brainier. If you write numbers down for some reason you need to have polices and procedures in place to insure that the data is not taken off site. Also, they need to be destroyed and secured in store (i.e. locked) until they are destroyed. 11) Test your processes and security systems. Make sure that you have a way to see if the network has been comprimised (hacked). Even just USB drives plugged in, software downloaded that is not approved or a wireless devices installed can through this question. Make sure you don’t let your POS become a home computer. Also, you have to have an qualified internal or external party perform a quarterly scan. 12) Maintain a policy that addresses information security. This concerns a lot of security issues in your store. One of the things most stores have never thought about is that you must have policies and procedures in place as far as employee electronic devices. Yes you are supposed to have a list of which employees are allowed to have what type of electronic devices in your store!